Comments Off on Morning Advising Walk-Ins are Cancelled. Morning Advising Walk-Ins are Cancelled. The College of Management has two different job openings for the Spring semester, with opportunities to start in January. If you are looking for a job, and qualified for either position, please fill out the application and submit to the College of Management in M-5-610 or email to Rebecca Folsom at rebecca.folsom@umb.edu. Must be able to work independently, be responsible, ethical, and contientious. Must have a strong desire to help others and want to make a difference. Must be willing to learn to work with students in both one-on-one meetings and group workshop settings. Must have a strong academic performance in recent semesters. Must have a flexible schedule with 4-10 hours a week commitment depending on department needs. The College of Management main office will be closing at 5:00pm today, Tuesday, December 17th. We apologize for the inconvenience and wish everyone to be safe in their travels and good luck on their final exams. Comments Off on Winter break, a great time to earn MAP Miles! Winter break, a great time to earn MAP Miles! Did you know that the winter break is a GREAT time to earn MAP miles? There are Ongoing Opportunities where you can earn miles on your own time, including a Job Shadow, Informational Interview, or other opportunityexperience that is both great professional experience, and eligible for MAP Miles! Check out ALL the Ongoing Opportunities on our website! We wish you all a warm and happy Winter break and look forward to seeing you all soon! P.S. Remember to check out the MAP Portal for events too, we may have more during the winter session! These are the MAP events for the week of December 9, 2013. Importance of Business Etiquette: Starts at 3:00 PM in M-1-207. MAP Miles earned: 50. Beta Gamma Sigma Presents: Stress Management and Relaxation: Starts at 3:00 PM in CC-2-2545. MAP Miles earned: 50. Networking Event: Starts at 4:00 PM in CC-Alumni Lounge (2551). A response is required for this event. MAP Miles earned: 100. In Pursuit of Capital: Starts at 6:00 PM in Cambridge Public Library, 449 Broadway, Cambridge, MA. A response is required for this event. MAP Miles earned: 100. Resume Presentation: Starts at 11:00 AM in H-11-0011B. MAP Miles earned: 50. Reminder! Keep your phone in your pocket! Looking down at your phone looks like you’re disrespecting the speaker and you might miss out on important information. Comments Off on Last chance to register for tomorrow’s employer networking event! Last chance to register for tomorrow’s employer networking event! Are you graduating in December 2013 or May 2014? Are you looking for a summer internship in 2014? If you answered yes, THEN register now for the Networking Event on Tuesday, December 10th from 4pm-6pm in our Campus Center, 2nd floor, Alumni Lounge. With only 25% of all jobs formally posted (75% are obtained through formal or informal networking), this event will serve as a great opportunity to enhance your networking skills for future career opportunities and connect with alumni and potential employers who are interested in building their company’s talent pool. Resume Quick Checks: email your resume attached as word doc to Matthew.Power-Koch@umb.eduto schedule a time listed below! Any questions please contact Mattew.Power-Koch@umb.edu or call (617) 287-5519. The last day of classes for the Fall semester is Friday, December 13th. The week of December 16th-20th is Finals Week. If you haven’t already done so, you should log into your WISER account and check your final exam schedule as final exams can be held at different times than your regularly scheduled classes. As a reminder, the CM Tutoring Center will close on Friday, December 13th for the semester. These are the MAP events for the week of December 2, 2013. Personal Market Pitch: Starts at 1:00 pm in H-11-0011B. MAP Miles earned: 50. City Year Boston Employer Information Session: Starts at 2:00 pm in H-11-0011B. MAP Miles earned: 50. Beta Gamma Sigma Presents: Stress Management and Relaxation: Starts at 2:00 pm in CC-2545. MAP Miles earned: 50. Social Enterprize Speaker’s Series–CITY YEAR: Starts at 6:00 pm in the Ryan Lounge M-3-721. A response is required for this event. MAP Miles earned: 75. Getting into Supply Chain: Starts at 4:00 pm in CC-Ballroom B. MAP Miles earned: 50. Sustainable IT at EMC Discussion: Starts at 5:30 pm in CC-Ballroom B. A response is required for this event. MAP Miles earned: 75. Time is money! Please come early to each MAP event, and plan to stay the entire time. Arriving late or slipping out early disrespects the presenter, and makes you look bad! Don’t do it! The University charges $100.00 to all current students who initiate spring 2014 registration after December 31, 2013. This means anyone who plans to take at least one course in the spring semester, and does not enroll in something by that date will have this late fee added to their spring bill. Initiating registration simply means enrolling yourself in something – any course, really. Even if you know you will be taking 12 credits in the spring semester, but aren’t sure which classes or sections those will be yet – you can enroll in even just one class before December 31 – and you won’t be charged the fee. You can even drop or swap that course later when you are making your final registration selections and adding the classes you really want to take to your schedule on Wiser. So don’t delay – register today! If you need help with your course selections – please see your advisor. It is also important to note that new groups of students will be granted access to management major classes over the next seven weeks, including non-CM students and newly admitted students (new student orientation starts December 16!). This means class availability in CM and around campus will start to diminish quickly. This fee does not apply to students graduating in December 2013, or to those students who never enroll in any spring 2014 courses here. Focus on improving your resume & interviewing skills so you are READY to take advantage of the coming opportunities connected to Career Services and the VDC. Participate in a Mock Interview and get feedback from a Sales 2.0 Practitioner! Get a crash course on modern sales. 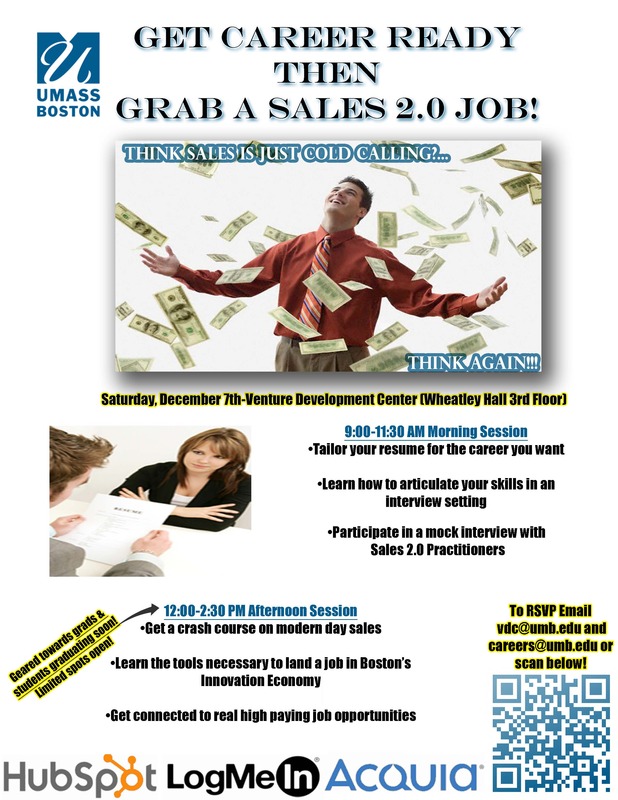 Learn the tools necessary to land a career in Boston’s Innovation Economy. Get the inside track on of the 50 job opportunities connected to the Entrepreneurship Center and Career Services. To RSVP, please: email vdc@umb.edu. If you have further questions about this information session, please direct them to vdc@umb.edu.